Art & Copyright is the result of a selection of texts and works among a great number of proposals received in an open call for submissions. Also included are some texts directly selected by the editorial committee due their relevance to the topic. In this issue, our Virtual Gallery hosts the work of several artists and is presented as a group exhibition. Following the interdisciplinary nature of InterArtive, the selected texts and artworks intend to give an overview –as complete as possible- of the phenomenon of copyright and the free culture movement as its counterpart. The content of this special volume raises the issue of copyright in relation to programming, music, digital culture, but also in the context of science and biology –copyright laws applied in medicine and life itself. At the same time, it highlights the issue of appropriation as a means of creating culture: although artistic creation and scientific research had always been based on the achievements of the past, today’s remix culture projects the value of creation as a “yeast” for subsequent transformations. The works and projects presented in the online exhibition create an open and all-encompassing path: Copyright laws and rights, violation and piracy, ownership and dialogue with art history and cinema, literature and language itself, Copyright versus open culture. 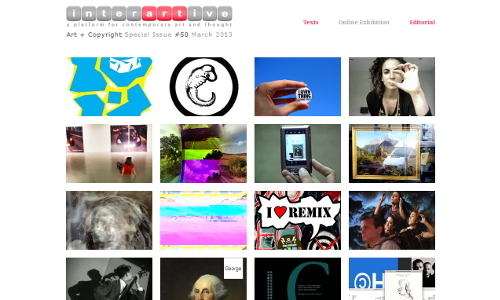 I have several gifs from the upcoming Copyright Atrophy project, which is due to launch next month, as part of the issue.